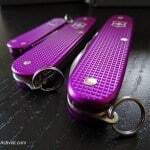 Victorinox stands for Quality, Innovation, Functionality and Iconic Design. These values are completely in line with the Swiss heritage of the company. Therefore, Victorinox is the perfect ambassador for Switzerland in the world. At LuxuryActivist.com, we have put together an exclusive selection for the Holiday season and our angle was: Black is the new black. For the kitchen cutlery collection, Victorinox developed a special line, based on Ceramic knives. You have 2 colors: White and Black. There are 4 different sizes and shapes: 8cm, 12cm, 15cm and the Santoku 17cm. The usage of ceramic in the kitchen is an interesting topic with several advantages. A ceramic knife manufactured in the state of art, will procure you the best efficiency in terms of cutting. It will also have an incredible resistance through time. Last but not least, the Ceramic material has also the capability to not transfer tastes from one ingredient to another. This means that you can cut onions for example and then meat without having any transfer. he Victorinox ceramic knife is manufactured from high-purity zirconium oxide (to a percentage of almost 100%). As a result, the knife blade is almost as hard as a diamond. The blade remains sharp over a very long period and has an impressively high cutting quality. Each watch has a story. Each watch has a starting point, a special inspiration that will lead to a specific design and functionality. The Victorinox Swiss Army Alpnach has a great one. Inspired by the legendary Cougar AS 532 helicopters of the Swiss Army, Alpnach is also the name of one of the top military bases in Switzerland. So this mechanical watch has a cutting edge look, and we picked up the full black look here. Black dial and full black PVD treatment on a stainless steel bracelet. Here is a nice video by Victorinox showing the parallel between the watch and the helicopter. Welcome to a man’s world. Victorinox Spectra 2.0, high-tech travel. Victorinox became in the past 20 years one of the top 5 best brands for luggage and travel gear. From professional and business travelers to lea sure and personal holidays, Victorinox has everything you might need. With this special collection called Spectra, Victorinox crosses the standard rules of design and proposes a futuristic look for an amazing ultra-light luggage. Providing extra capacity on a short journey, this ultra-light, wide-body case is constructed of break-resistant 100% pure Bayer polycarbonate and meets most global carry-on regulations including IATA. Victorinox Guardian Vest, outdoor with style. Victorinox has developed recently a full line of outdoor wear. Blending comfort, functionality and style, Victorinox fashion translates the ingenuity of the Swiss Army knife into apparel. Here displayed is the Guardian Vest. With the grey camouflage interior, it redefines the gentlemen outdoor vest. Christopher Raeburn is the Artistic Director and he understands the spirit of the company and its heritage. Switzerland has a natural landscape that you probably cannot find something equivalent in the world. Pure landscapes with the Alps, forests and lakes represent an endless source of inspiration. 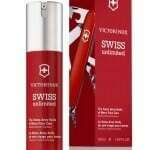 In terms of Perfumery, Victorinox brings you the best Switzerland can offer in terms of perfumery creation. They seek inspiration in the natural landscapes in order to bring a specific signature in such a competitive industry. With Victorinox Swiss Army Altitude represents a fresh, yet masculine fragrance in which the flacon silhouette represents the oxygen bottles the Swiss Army carries when the soldiers go up to the top of mountains. 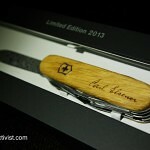 Info sourced at Victorinox official end of the year communication and LuxuryActivist editor’s choice. All content is copyrighted with no reproduction rights available.